Less than perfect, always entertaining. Guys. If you think every salad needs to be healthy and/or puny, here’s the thing: you’re wrong. Please say hello to your new friend, the Wedge. 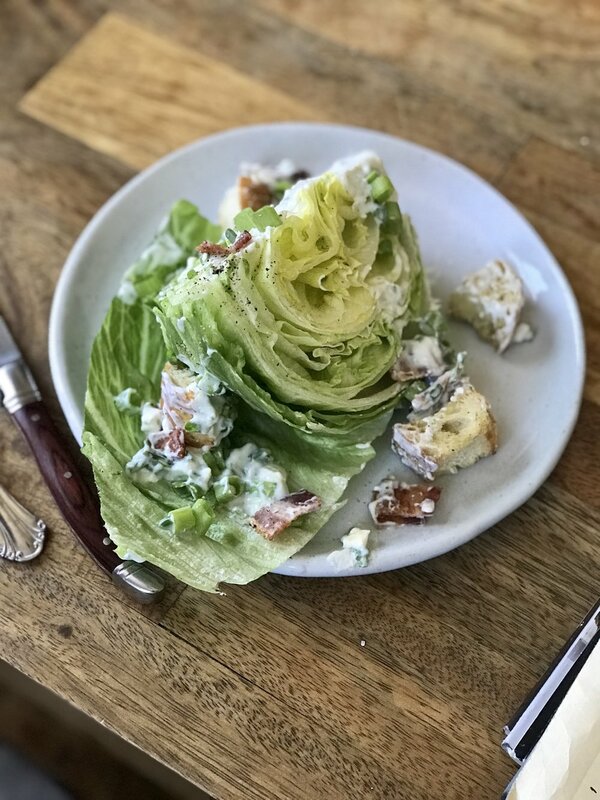 Besides the iceberg lettuce, there is nothing healthy or puny about the Wedge—it is a behemoth of goopy blue cheese and chewy bacon, topped with fat stacks of toasted bread-squares drenched in olive oil. It’s hearty enough to eat on its own, but if you want to eat it as a side salad with your roasted meat or burgers, please just do it. Healthy salads are cool, but c’mon, live a little. 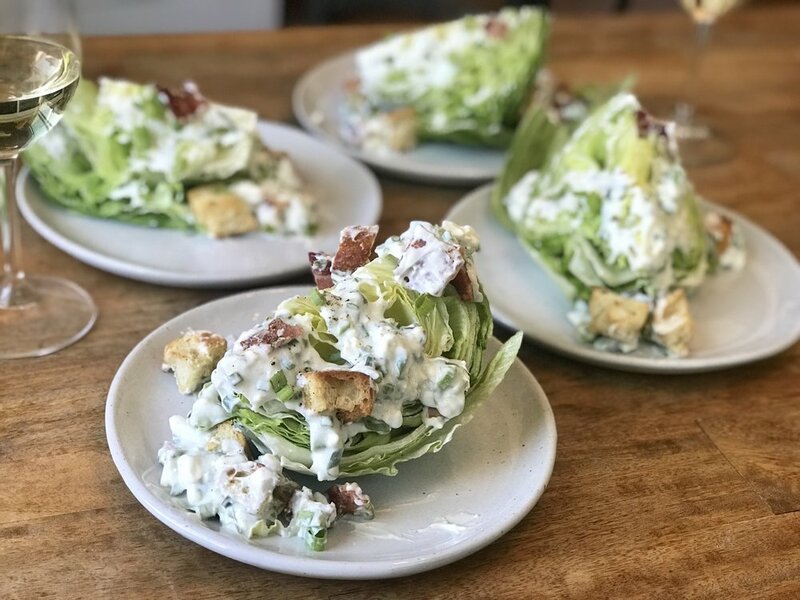 Hearty enough to eat on its own and light enough to accompany any sort of meal, the wedge salad is a staple at steakhouses for a reason. The key is this: This salad can be whatever you want it to be. You can add and subtract whatever you like. Avocado? Sure! Nuts? Go nuts! Consider this recipe a canvas for creativity—perfect as is but also ready for additions or subtractions based on taste. Save time by cooking the bacon and croutons together. Lay your bacon down on a sheet pan lined with aluminum foil—use a rack if you want to make your bacon XTRA crispy. Rip or cut that crusty bread into bite-sized pieces, toss with olive oil, and lay down on a sheet pan. Roast both for 12–20 minutes, depending on the thickness of the bacon and bread. Start checking at 12 minutes—timing will depend on personal doneness preference. Transfer the bacon to a paper towel–lined plate. When the meat has cooled, chop into thick pieces. Toss the croutons with salt and pepper. While the bacon and croutons are baking, make the dressing. *If you or a guest hates blue cheese, feel free to leave it out of the dressing. Give your guests blue cheese crumbles as a topping instead—and leave the hater totally blue-cheese free. Quarter your head of iceberg lettuce into four wedges. Serve either family style in a big, shallow bowl/platter or individually on plates. 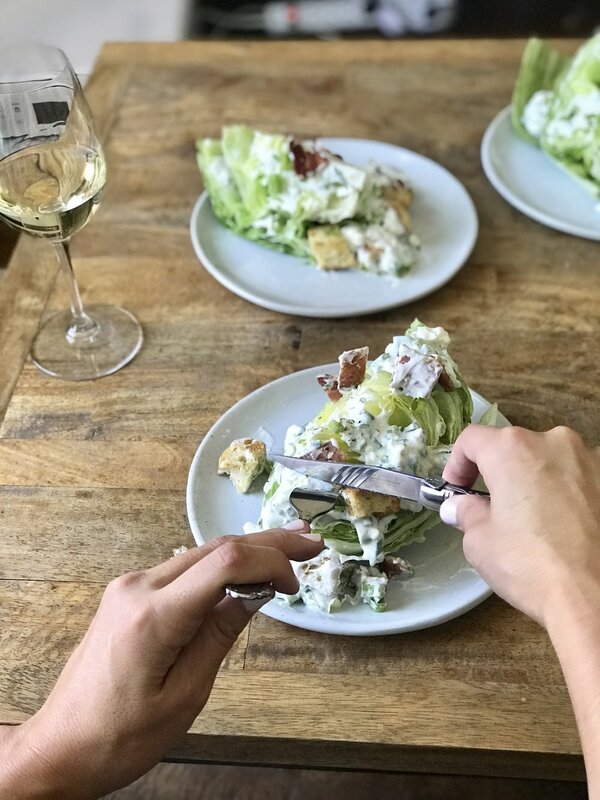 Top the lettuce wedges with dressing, bacon, croutons, and finely chopped chives.